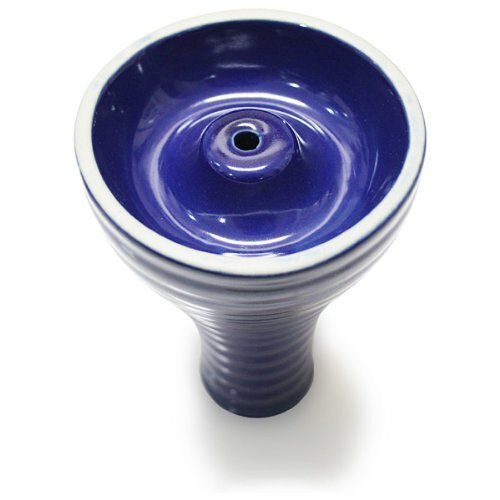 The hookah large clay bowl design prevents shisha and its moisture from falling through and making a mess as well as causing good shisha to be wasted. The funnel bowl is different from the standard bowl, it has a single hole, an inverted funnel, in the center instead of multiple small holes like the traditional style bowls. 4.8" inches tall (12cm). Inner diameter about: 2.8" (7cm). This hookah bowl holds about 20-30 grams of shisha. If you have any questions about this product by Mega Phunnel Clay Bowl - Blue, contact us by completing and submitting the form below. If you are looking for a specif part number, please include it with your message.